Are you one of the millions of adults in the UK who are unhappy, self-conscious and embarrassed about your smile? Many people unfortunately spend their entire lives covering their mouths when they laugh, smile or talk – they feel stuck because they do not want to wear adult metal braces for years or they are concerned that other corrective teeth straightening procedures could be too invasive or too expensive. But it doesn’t have to be this way any more… with Invisalign treatment here at Castelnau Dentists in Barnes there is now an highly effective, safe, affordable and practically invisible solution that can fit around your lifestyle. 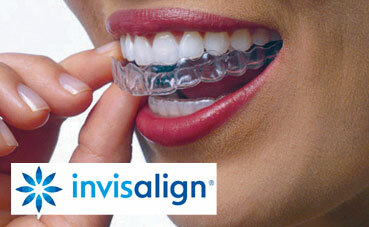 Invisalign® uses a pair of transparent aligners which are moulded to the exact shape of your teeth using 3D computer imaging. These Invisalign aligners are so comfortable to wear that you will soon forget that they are there – they are also invisible when worn and so there is none of the embarrassment that comes with wearing large metal braces. The Invisalign aligners can be removed for eating, drinking, brushing and flossing your teeth, but otherwise are worn continuously. Every fortnight the aligners are replaced by the next pair in the series so that your teeth are slowly moving and straightening without pain or discomfort. The use of aligners exerts a controlled force on the teeth: at different stages in the process, only certain teeth will be allowed to move. Thus the whole process is gradual, controlled and painless.